Stamps of choice. Some for background and one main image. 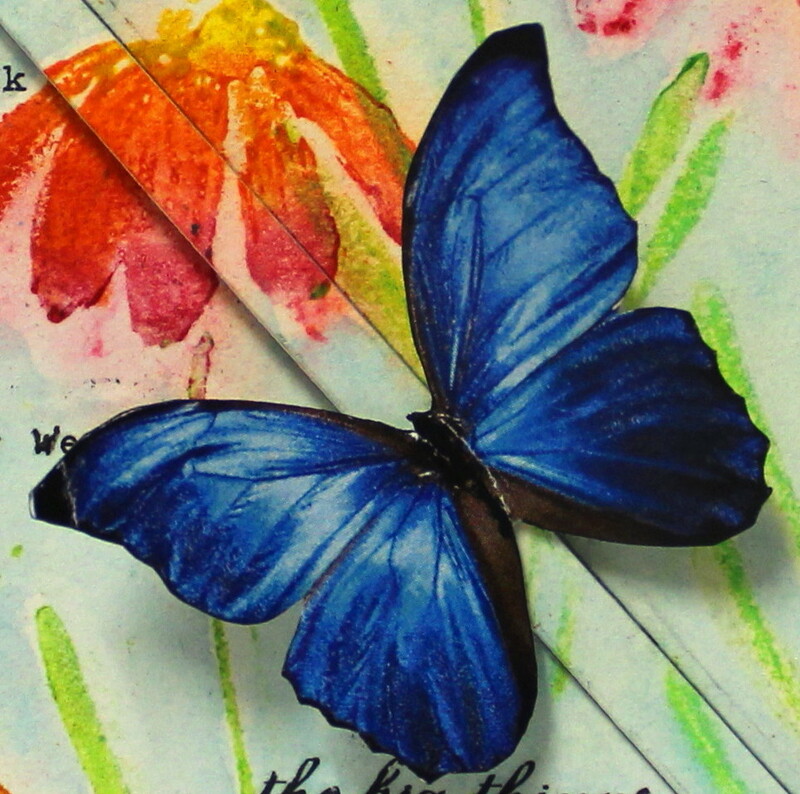 Using images that "fly" such as birds, angels, butterflies etc go well with this card. Coloured card stock for matting and card base. Black ink pad of choice. Ribbon and two beads with hole big enough for ribbon to go thru. Craft knife, craft mat, pencil, rubber, ruler, scissors, black or dark grey marker and glue or thin double sided tape. 1) Stamp images on background and main focal image or use a pre printed photo image as I have done for the blue butterfly. Colour images and back ground as desired. Trim main image with scissors around outline. I'm using a printed butterfly as my flying image. Edge main image with black or dark grey marker. Cut background to desired size. 2) Work out in which direction you want the main image to move such as up/down, side to side or along an edge. I've decided mine will go from one corner diagonally to the other corner. Lightly mark two side by side lines with a pencil, along area you want the image to move along but leave a 1cm space at either end of both lines. That is don't cut right to the edge of the card!. Use craft knife and ruler and cut along the marked lines. This is the slide bar and will have the image at front and ribbon at make. Width of the bar depends on size of your flying image. Width has to be slightly smaller then the width of the image. Cut another small slit side on to the slide bar and a few mm from the first two lines at either end. It has to be wide enough for the ribbon to fit thru. You can make the ribbon come out at the edge of the card without this extra little slit but it makes the card lift up at edges with repeated use of the ribbon slide mechanism. 3) Cut one to two thin strips of scrap card to make the slide tabs. Trim so they are just long enough to fit under the slide bar and overlap on top. The slide tabs need to fit loosely over the slide bar and not be a firm fit so they can move up and down the bar. You will only need one slide tab for a small image and two for larger images. Test spacing of the slide tabs by placing image on top and ensuring the slide tabs can't be seen underneath. 4) Glue the tab in place by placing glue on the overlap of the tab and NOT on the slide bar. Glue image on top of the overlap area of the slide tab and NOT onto the slide bar. 5) Use ribbon slightly smaller in width to the slide bar. Cut ribbon to twice the length of the slide bar. Turn card over to back with slide tab in middle of the slide bar. Find centre of ribbon. Apply glue ONLY to rear of slide tab NOT on slide bar and adhere centre ribbon in place on slide tab. Poke ends of ribbon thru side on slit in front of ends of slide bar so they come out at front. 6) Apply glue all over back of card but not near slide bar, on ribbon or on side on slits. I've shaded the area to be glued on mine so you can see where the glue will go. 7) Glue card to base card. Attach a bead to each end of the ribbon. Do this by pulling image all the way to one end of the slide bar and attach bead to that end. Trim excess ribbon off. Pull ribbon/image to other end and repeat this. Add words of choice and card is complete. Pull ribbon to make the image move across the card. 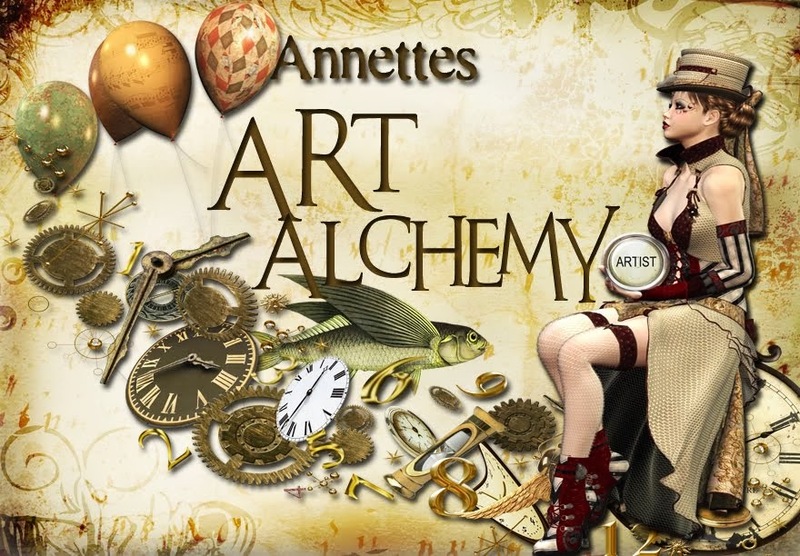 WOW Annette, this is amazing! Love it and just have to try. Thanks for the techniques you post, each of them a gem. Such a beauty! I have seen slider cards, but nothing like this with a ribbon! How cool. Thank you for taking the time to share the technique! I know that it must be a lot of work. I can't wait to try one! Hugs Lucy. (who has The Aviator around my neck always)! WoW! Thanks for the tutorial. I fancy having a go. Lovely idea. Hi Annette, thanks for visiting (and your lovely comments)and happy No WOYWW! I love your slider card, I have never seen one that nice and I might try this from your clear tutorial. I first bought gesso because I vaguely remembered it being used for something in Craft Stamper, and then didn't use a lot until I joined in the Alpha Challenge, so I though I better get some more lol.